Philip Walter Foden (born 28 May 2000) is an English professional footballer who plays as a midfielder for Premier League club Manchester City and the English under-21 national team. Foden's breakthrough into professional football came in 2017 when won the FIFA U-17 World Cup Golden Ball award following England's successful campaign. He made his debut for City during the same year and in December was named BBC Young Sports Personality of the Year. He has since made over 30 appearances for the club, winning four major honours including the youngest recipient of a Premier League winners' medal. In 2019, he became the club's youngest-ever goalscorer in the UEFA Champions League and is the youngest English player to both start a match and score in the knockout stages of the competition. Born in Stockport, Greater Manchester and a boyhood supporter of Manchester City, he joined at the age of eight and signed his Academy scholarship in July 2016. He was privately educated at St Bede's College, with his tuition fees being paid for by Manchester City. On 6 December 2016, City head coach Pep Guardiola included Foden in the matchday squad for the Champions League group stage match with Celtic; he was an unused substitute in the 1–1 home draw. In July 2017, Foden was included in Manchester City's squad for the club's pre-season tour of the United States, where he performed impressively in a 0–2 loss to Manchester United and also started in a 4–1 win over Real Madrid. Guardiola stated after the Manchester United match: "It’s a long time since I saw something like this. His performance was another level. He’s 17-years-old, he’s a City player, he grew up in the academy, he loves the club, he’s a City fan and for us he’s a gift." After making several appearances on the bench at the start of the 2017–18 season, Foden made his Manchester City debut on 21 November 2017 in a Champions League game against Feyenoord, coming on in the 75th minute for Yaya Touré. He became the fourth youngest English player to make an appearance in the Champions League (17 years 177 days). On 6 December 2017, Foden broke the record previously held by Josh McEachran to become the youngest English player, at the age of 17 years and 192 days, to start in a UEFA Champions League match, doing so in a 2–1 defeat to Shakhtar Donetsk. He also became the first player born in the year 2000 to start a match in the competition. He made his Premier League debut as a substitute in a 4–1 win against Tottenham Hotspur on 16 December 2017, appearing at the 83rd minute for İlkay Gündoğan. Foden featured as a late substitute for Sergio Agüero in the EFL Cup Final on 25 February 2018, helping City secure a 3–0 victory against Arsenal at Wembley Stadium. The following month, he broke Kieran Richardson's record to become the youngest English player to start in a knockout-match in the Champions League, doing so at the age of 17 years and 283 days in a 4–0 win over Basel. On 13 May, he became the youngest ever player to receive a Premier League winners' medal. Foden was part of the City's starting line-up for the FA Community Shield on 5 August 2018, playing a total of 75 minutes as well as assisting Agüero's first goal of the game in a 2–0 victory over Chelsea at Wembley Stadium, marking Foden's third winners' medal of the calendar year. On 25 September 2018, he provided an assist to Riyad Mahrez and later scored his first senior goal in injury time to secure City a 3–0 away win against Oxford United in the third round of the EFL Cup. Foden scored his first home goal at the Etihad Stadium, netting the second for City during their 7–0 victory against Rotherham United in the third round of the FA Cup on 6 January 2019. Three days later, Foden was again on the scoresheet as he helped City defeat Burton Albion 9–0 in the first leg of the EFL Cup semi-finals. On 12 March 2019, Foden scored his first Champions League goal during the second leg of the last-16 tie against Schalke, as City won 7-0 (10-2 on aggregate). In doing so, he helped the club equal the record for the largest winning margin in the knockout-phase of the competition. His goal also saw him become Man City's youngest-ever goalscorer in the Champions League and the youngest English goalscorer to score in the knock-out stages of the competition, aged 18 years and 288 days. At the start of the following month, he made his first league start for the club in a 2–0 win over Cardiff City, becoming the youngest English player to do so since Daniel Sturridge in 2008. After the match, City manager Pep Guardiola told media that he expected Foden to be an important Manchester City player "for the next decade". Foden scored his first Premier League goal on 20 April 2019, with the only goal in a 1–0 victory over Tottenham Hotspur. Upon doing so, he became the third youngest player to score for the club in the Premier League, after Micah Richards and Sturridge. Foden is an England youth international, currently playing for the U21 team. In May 2017, he scored in the final of the 2017 UEFA European Under-17 Championship as the England under-17s suffered a penalty defeat at the hands of Spain. In October of the same year, Foden gained widespread press attention after scoring twice in the final of the 2017 FIFA U-17 World Cup, also against Spain, as England won the competition. He was named as the best player of the tournament. He won the FIFA U-17 World Cup Golden Ball award in 2017 where he also gained some widespread press attention and significant media coverage. Foden is left-footed, and can play as a wing-back, or a winger on the right, though Pep Guardiola has described him as "more of a midfielder". In 2017, Guardiola described him as "a special player", saying: "It's dangerous to say good things about young players because they are still young, and they have to grow and they have to learn many, many things... But we have a lot of confidence to help him, because we believe he is a guy who has potential, even if he's not strong, he's not tall." In 2017, Louise Taylor of The Guardian described Foden as "boasting tight, adhesive control and blessed with the knack of drifting past opponents". In 2018, veteran football writer Brian Glanville described him as a "gifted and precocious teenager", adding: "Young players of his skill and inventive quality are pitifully thin on the ground." ^ "Premier League clubs publish retained lists". Premier League. 9 June 2017. Retrieved 18 December 2017. ^ "P. Foden: Summary". Soccerway. Perform Group. Retrieved 25 April 2018. ^ "2017 Under-17 World Cup squad lists" (PDF). FIFA. Archived from the original (PDF) on 30 October 2017. Retrieved 31 October 2017. ^ "Man City fans loved seeing Phil Foden make Premier League history". Manchester Evening News. 13 May 2018. Retrieved 22 April 2019. ^ "City Starlet Foden: Silva's My Idol". Manchester City. 20 July 2017. Retrieved 17 December 2017. ^ "Manchester City U18's Phil Foden profile". Manchester City. Retrieved 17 December 2017. ^ McNulty, Phil (6 December 2016). "Manchester City 1–1 Celtic". BBC Sport. Retrieved 17 December 2017. ^ Handler, Paul (21 July 2017). "Guardiola: Foden display 'Another level'". Manchester City. Retrieved 17 December 2017. ^ Clayton, David (27 July 2017). "City 4 Real Madrid 1". Manchester City. Retrieved 17 December 2017. ^ "Foden display 'another level'". Manchester City. 21 July 2017. Retrieved 14 January 2019. ^ Dawkes, Phil (21 November 2017). "Manchester City 1–0 Feyenoord". BBC Sport. Retrieved 17 December 2017. ^ a b "Phil Foden: Champions League record for Man City teenager". BBC Sport. 7 December 2017. Retrieved 13 March 2019. ^ McNulty, Phil (16 December 2017). "Manchester City 4–1 Tottenham". BBC Sport. Retrieved 17 December 2017. ^ a b McNulty, Phil (25 February 2018). "Arsenal 0–3 Manchester City". BBC Sport. Retrieved 25 February 2018. ^ "Teen starlet Foden breaks Champions League record with Man City start". Goal. 7 March 2018. Retrieved 13 March 2019. ^ Fay, Richard (13 May 2018). "Man City fans loved seeing Phil Foden make Premier League history". Manchester Evening News. Retrieved 14 May 2018. ^ a b Bevan, Chris (5 August 2018). "Chelsea 0–2 Manchester City". BBC Sport. Retrieved 5 August 2018. ^ McNulty, Phil (25 September 2018). "Oxford United 0–3 Manchester City". BBC Sport. Retrieved 26 September 2018. ^ Johnston, Neil (6 January 2019). "Man City put seven past Rotherham to reach fourth round". BBC Sport. Retrieved 14 January 2019. ^ Emons, Michael (9 January 2019). "Man City 9–0 Burton Albion". BBC Sport. Retrieved 14 January 2019. ^ "Seven-goal Man City trash Schalke in last 16". BBC Sport. 12 March 2019. ^ Pollard, Rob (12 March 2019). "Manchester City equal Champions League record". Manchester City Football Club. Retrieved 13 March 2019. ^ Brennan, Stuart (12 March 2019). "Man City break Champions League record in rampage against Schalke". Manchester Evening News. Retrieved 12 March 2019. ^ Howson, Nick (13 March 2019). "Foden becomes City's youngest Champions League scorer as records tumble in Schalke rout". Goal. Retrieved 14 March 2019. ^ "Phil Foden: Man City youngster will be 'important player for decade'". BBC Sport. 4 April 2019. Retrieved 4 April 2019. ^ "Phil Foden: Man City youngster will be 'important player for decade'". 3 April 2019. Retrieved 4 April 2019. ^ McNulty, Phil (20 April 2019). "Manchester City 1–0 Tottenham: Phil Foden goal sends City top". BBC Sport. Retrieved 20 April 2019. ^ "Young Lions Beaten on Penalties in UEFA EURO U17 Championship Final". The Football Association. 19 May 2017. Retrieved 6 February 2018. ^ "England win Under-17 World Cup as Phil Foden inspires incredible comeback victory over Spain". The Independent. 28 October 2017. Retrieved 6 February 2018. ^ "England Win Under-17 World Cup as Phil Foden Inspires Incredible Comeback Victory over Spain". The Independent. 28 October 2017. Retrieved 17 December 2017. ^ a b c Lee, Sam (28 October 2017). "Phil Foden: Who Is England's 17-Year Old World Cup Hero?". Goal. Perform Group. Retrieved 17 December 2017. ^ "Foden Scores England's Fifth to Seal U17 World Cup". BBC Sport. 28 October 2017. Retrieved 17 December 2017. ^ a b Taylor, Louise (25 October 2017). "Meet the England players who have reached the under-17 World Cup final". The Guardian. Retrieved 15 April 2019. ^ Glanville, Brian (21 August 2018). "Phil Foden Should Leave Manchester City". World Soccer. Retrieved 15 April 2019. ^ "Games played by Phil Foden in 2016/2017". Soccerbase. Centurycomm. Retrieved 25 April 2018. ^ "Games played by Phil Foden in 2017/2018". Soccerbase. Centurycomm. Retrieved 9 August 2018. ^ "Games played by Phil Foden in 2018/2019". Soccerbase. Centurycomm. Retrieved 10 March 2019. ^ "Phil Foden: Overview". Premier League. Retrieved 15 May 2018. ^ McNulty, Phil (24 February 2019). "Chelsea 0–0 Manchester City". BBC Sport. Retrieved 10 March 2019. ^ Shamoon Hafez (17 January 2019). "England's U17 World Cup winners - where are they now?". BBC Sport. Retrieved 17 January 2019. ^ "Technical Report – Team of the Tournament". UEFA. Retrieved 17 December 2017. ^ "FIFA U-17 World Cup India 2017 – Awards". FIFA. Retrieved 17 December 2017. ^ "BBC Young Sports Personality of the Year 2017: Footballer Phil Foden wins". BBC Sport. 17 December 2017. Retrieved 17 December 2017. 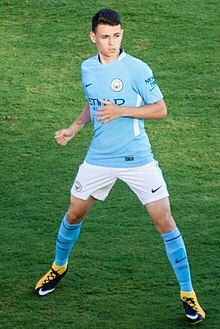 Wikimedia Commons has media related to Phil Foden.